This is a first in a series on the hosting candidates for the 2018 World Cup. Perhaps the least impressive of the three likely European bids (England and Russia being the others) at first glance, the Benelux bid should still be taken seriously. After all, they have the delights of Total Football and Belgian beer going for them. And as Belgian bid organiser Alain Courtois emphasised, rotating the World Cup around the major nations forever is no fun. But, I hear you cry, Benelux isn’t even a real place, is it? Well, it doesn’t have much of a ring to it, being the hideously abbreviated form for the neighbouring countries of Belgium, the Netherlands and Luxembourg. Let’s go with the old-fashioned ‘Low Countries’ instead. The photo below explains that former moniker pretty neatly, in an aerial shot of the Netherlands. And let’s get one other thing straight: Luxemburg’s involvement is minimal (they won’t even host a game), so there won’t be the farce of the 150th Fifa ranked team gaining automatic qualification. Everyone will be happy, on the other hand, that the Netherlands wouldn’t have the chance to mess up their qualification if they were the hosts. And if it took hosting the World Cup for the Dutch to get over their addiction to heartbreak, then most fans of the beautiful game would be happy to see it. I’m sure I don’t need to elaborate on the delights of the Oranje for you. And Belgium. . . Well, Enzo Scifo was a great player. In the 1980s. Stadia-wise, the Netherlands currently only have two with a capacity over 40,000, the Amsterdam Arena (Ajax, below) and De Kuip (Feyenoord). PSV’s Phillips Stadium, at 36,500 might be able to cut the mustard for the World Cup, but it’s a close call. The Dutch will surely need to build or upgrade at least three more stadiums — in Euro 2000, SBV Vitesse’s Arnhem Stadium was used, but its capacity is under 30,000. Belgium is even weaker stadium wise. The only 40,000+ capacity stadium is what was once known as Heysel, when it was the dilapidated structure partially to blame for the 1985 disaster that saw 39 Juventus fans die at the European Cup final. Charles Picque, premier of the Brussels region, made it clear in an address last month that a disused railway yard some four kilometres north-east of the city centre was the favoured site. Together with upgraded rail connections and a motorway extension, the construction bill could reach one billion euros ($1.46 billion) and is part of a bold revamp that Europe’s unofficial capital city plans in the years ahead. The 60,000-70,000 seater stadium, itself set to cost up to 250 million euros, may not be ready until 2013-2015 but the plans are already advancing. The state body overseeing the disused railway yard has received around 20 proposals for a commercial development including a stadium. Culturally, I think most of us would rather spend the World Cup in Amsterdam than London or Moscow, wouldn’t we? And then there’s all that beer in Belgium. . .
Belgium has much else to offer, too, if in a more prosaic sense. Positioned at the heart of Europe, with the Eurostar flying to London and Paris, and bordering Germany as well as the other Benelux countries, geographically it would be in an excellent position to draw fans from across Europe. One potential problem is the political turmoil in Belgium. We don’t usually associate the word “turmoil” with Belgium, but it’s not out of the realms of possibility the country could break up into its disparate parts (Flanders, Wallonia) by the time the final vote comes around. Another issue is that Fifa have not spoken favourably of having another jointly hosted tournament, despite the precedent of Japan-South Korea in 2002, and the successfully held 2000 European Championships by the Benelux nations themselves. That’s why the Benelux countries have announced their bid not as a “joint” effort as Japan-South Korea did, but as “one entity, one political entity with a common economic base.” It’s true that the region is more integrated than Japan-South Korea, but this smacks of semantics somewhat, and it remains to be seen if Fifa will be convinced. As the World Cup grows and grows, it might just be out of the reach of the Low Countries, which could well be something of a shame. Would you be excited about a Benelux World Cup? Find the best odds and promo on William Hill to bet on 2018 World Cup! 😉 Sure. And Brussels will be split into east and west Brussels. I would love to see the World Cup in Belgium and the Netherlands though. November 26, 2007 at 11:12 pm Max J. Frankly, I’m hoping every other country will piss off, thus leaving me to watch group stage games in a drunken stupor at the Meadowlands in 2018. That having been said, this is a pretty cool alternative, though I wonder where the “group bid” madness will stop. Iberia 2026? Greater East Asian Co-Prosperity Sphere 2030? You don’t think the political crisis in Belgium is really serious, Jan? I’m no expert, but it looks like a big deal to me. Her (slightly tongue-in-cheek) conclusion is that, “more than Belgians want a real breakup, they psychologically relish the idea of being a little region of anarchy in an increasingly boring and stable Europe”. The occasion of the post was a chocolate cake celebration Flemish leaders held to celebrate “100 Days of Chaos”. At the time I thought she was on to something. I think it’d be a very fun and interesting World Cup but I’m not too hot on joint bids for the World Cup personally. It would be a great place to vacation and see some outstanding football but I think there’s too much going against the bid for it to happen. “one entity, one political entity with a common economic base.” are they putting together one super team to go alone with one entity? 🙂 Having three host countries might be too much, but a joined bid from European just makes sense. I think that 2018 is going to England (if nothing serious happens to make it a security risk). England will get African and South American votes and if Blatter still in power he will back them. FIFA can make the most money by staging World Cup in England without any headaches. “Iberia, what?” Interesting, Adam. There are far too many European contenders right now; its going to be a battle royale just whittling them down. Davyd, stick around for the rest of the series as we’ll look at England and the other candidates too. “It means England, Russia, Australia, Holland and Belgium (jointly), China, Japan, USA, Canada, Mexico and now Spain/Portugal have either said they will be bidding for 2018 or are considering doing so.” I can’t remember Canada saying they will be bidding for 2018 or are considering doing so and i can’t see us getting ready anytime soon. I wounder if this guy are getting payed for every word, so they just putting every country in the mix. That’s a good spot about Canada, Davyd. I think I’ve seen them mentioned in such a list somewhere before too, but the Canadians I’ve spoken to about hosting the World Cup think there’s no way they could bid successfully. The problem is Brussels. Belgium isn’t just Flanders and Wallonia, it is Flanders, Wallonia and the Brussels region. It’s like the thing with West Germany, East Germany and Berlin in the middle. But that only worked because of the cold war. So without a major civil war or anything, I can’t see that Belgium is in real danger. Been looking forward to reading this and it didn’t disappoint! 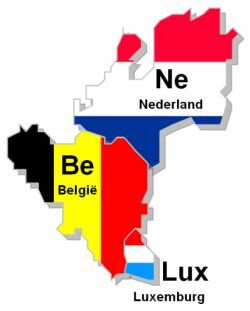 If Belgium broke up, it would be quite different to any other country breaking up before in history, as the newly partitioned states would still all be part of the European Union. This would make it much less traumatic, as people would still have many of the same rights in each country as they do now. There would never be a civil war, but a peaceful break up would be an easier process than in most other places. But yeah, Brussels would still be an issue and I don’t think a break-up is necessarily likely: on the other hand, I thought it was worth mentioning as it can’t be ruled out entirely. I’m not really sure why Luxembourg are involved, but apparently they would hold a “FIFA congress” or something. I think you’re spot on that the stadia is the biggest issue for this bid, though I suppose that each country has a few 30,000 capacity grounds that could perhaps be upgraded to 40,000, which would cost less than building new ones. Oh, come on, I think it’s nice that Luxembourg get to be included. It’s like taking your little sister to the movies. When are they ever going to be able to do something like this on their own? Chris – the President of Brazil has said that Brazil will need to build TWELVE new stadiums before the 2014 World Cup. I don’t know whether that will really happen either, but if it’s even feasible for Brazil to build twelve stadiums in seven years I don’t see why the Benelux countries couldn’t manage seven or eight in eleven years.